A hymn might be briefly described as the poetic echo of our hearts in praise or prayer to God, blended with the melody that pours forth from our lips. Someone once wrote —It is a voice that speaks from the soul a few words that may represent a life. And sound and sense are wed in harmony. Not the music or the metre, not the happy fancies sweeter than a flower-bell honey-stored. With your life blood you will write. Not many have the gift of expressing themselves in such poetic language as the authoress who also wrote in one of our hymns —"And wing my words that they may reach the hidden depths of many a heart." Hymns have apparently been sung from the earliest days in some form or another, judging by the many Psalms and allusions to singing in the Scriptures, and besides this there is reference to musical instruments in use before the flood. Our hymn book—Music Edition—was first issued in 1914, with 256 hymns, about 1922, a supplement of 27 Hymns was added. 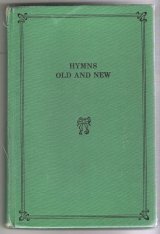 Next edition was issued in 1928, with 301 Hymns and an appendix of 12 additional tunes: later on in 1935, another supplement of 73 hymns was added. But in 1951, a complete recasting was printed, as the type was become so worn; the occasion was made use of in remodelling the book, it was considered it was becoming too bulky, consequently, a severe axing had to take place, resulting in many "old favourites" having reluctantly to be left out that room might be found for new hymns to be added. While there were many many hymns sent in for consideration, not many were considered suitable, lacking so much in poetic value, character, rhythm, etc., often they were but repetition of thoughts already expressed and better by those who knew something of the three "R's of poetry—"Rhythm, Rhyme and Reason." One looks for a theme, a thought or a text as a background to give it body or character, also a suitable tune to express the sentiment of the hymn. What would be welcomed for future editions is sound stirring hymns set to similarly inspired music, as unfortunately many hymns had to be set to ready-made tunes instead of them being tailor-made to fit. Again, quite a few rather nice hymns had to be left out as being suitable for solo singing, whereas the need of our book was for hymns that could be sung in either fellowship or gospel meeting by all the congregation. One often notices good hymns that are seldom sung, because of a tune that does not take and vice versa, a suitable tune considerably enhances the value of a hymn. For the purpose of our study, we will divide the writers into two—those written by our friends and those by writers unknown to us. We will, however, consider first the hymns set to tunes composed by the author, in each case taking our friends first. The first on the list is Glen Smith, born 26/2/1880 who has written 8 hymns to his own music: Nos. 104, 212, 214, 218, 227/8, 229, 230 and 251. Then Sam Jones wrote a few tunes to some of his numerous hymns: Nos. 126, 225, 250 and 266. Hugh Roberts, a Canadian worker from Enniskillen, wrote No. 198, and Geoffrey Bowdler of Wolverhampton wrote No. 155. Amongst the writers unknown to us, Mrs. Morris might be first mentioned, we have 2 of her hymns, Nos. 83 and 169. In the last edition the Hymn "Crowded out and stronger than the strong is He" was her's writing. This Mrs. Morris (McConnelsville of Ohio) was born in Ohio 1862, died 1925. In her youth she felt if she would write noble hymns she should live a noble life. She has had over 900 pieces published, being an accomplished musician as well as poetess, but in the prime of life she became blind, yet continued writing, her daughter taking down from her dictation. 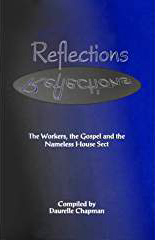 In Celestial Songs and in Redemption Songs (hereafter referred to as R.S.) there are 16 all her own tunes. In Songs of Praise and Power there are 59 of hers to own music. No. 112, from R.S. 240. In Cel. Songs there are 14 of his. No. 92 by A. J. Hodge, found in Gems of Song No. 80. No. 25 is by J. B. MacKay — from R.S. 91, he also wrote R.S. 662. Will L. Thompson, East Liverpool, Ohio, U.S.A. wrote No. 37 found in S.S. 414 where there are 3 others of his, and R.S. 95 where are 2 others of his. Then last of these is No. 35 by J. M. Whyte from R.S. 81. He also wrote No. 608 in R.S. Winnie (Adams) Cresswell wrote No. 224. She was a worker in the Maritime provinces of Canada and later became Mrs. W. Cresswell and lived in Prince Edward Isle until her death. Jack Annand wrote Nos. 164, 241, 283, 316, and 321. There is some nice poetry in most of his. He was born in 1891 and died 1957. Worked on a farm as a lad, professed when 19 years old, went forth when he was 22, first in N.S. Wales, then Victoria (Aust.) then came to Poland and Scandinavian countries. He wrote No. 319 while at Deb. Conv. 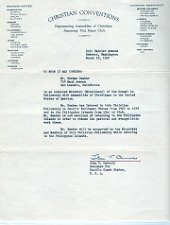 Mrs. Rene Beattie, a worker in New Zealand, wrote Nos. 36, 50, 77 and 264. No. 36 was written after she and her husband were some time on the roads looking for an opening. On getting the use of a barn, she sat down in it and penned the first two verses, later added a 3rd, and later on another which was not included when it reached here, which was as follows: "Come follow Him to mountain height, And learn His way and will for thee, look past the world and keep in view, Eternity, eternity." No. 165 was written by a friend in Australia, H. C. Berrett. He was Departmental Manager for Foy & Gibson, later similar position with Beckford's Manufacturing Chemist till R. C. Manager took over, then became traveller for dried fruit firm, finally helped his son in setting up in fruit shop. He died 2.3.55, aged 70 years. Robert Blair, who also laboured in New Zealand, was born at Otokia, near Dunedin N.Z. in 1874 and died in 1942. After selling some property left him in Scotland, he started out in the work in England, remaining two years before going to N.Z. where he was for several years, was for a time in Fiji, Samoa and Norfolk Isles, returning to Queensland where after 11 years he died. He wrote Nos. 185, 195, 235, 274 and 277. When he was in Exeter he pulled out a scrap of paper from his waistcoat pocket and asked another worker he met there if the verses he had written on it would do for a hymn, iIt is now our No. 276. William C. Carroll, born 1876, died 1953, went forth into the harvest field in 1903, spending the last number of years in Australia; he wrote Nos. 140 and 142. He came to Australia early in 1913. Blanche Chappell comes from Debenham, Suffolk, but has laboured for quite a time in Canada. She has written Nos. 232 and 284, both are inspiring hymns. James Craig—a brother of Jack Craig—was a chiropractor in Christchurch, N.Z. Yet was an intense sufferer himself towards the end, he wrote wrote Nos. 17, 263 and 334. No. 263 his first verse was borrowed from R.S. 457 by Eli G. Christy. He died July 20, 1953, aged 65 years. James Fawcett, from Fermanagh, has been a number of years in U.S.A. He wrote Nos. 173, 215, 221 239, 326. He died 10.8.1958. Harry Fleming, another U.S.A. worker, wrote No. 63. Tom Holmes was one of the friends living in Niagara Falls, was born in 1877 and died 1930; he happened to be at friend's home for meeting and died soon after the meeting in the home. He wrote a number of hymns but never cared to show them. No. 45 is one of them. Charlie Hultgren was a chiropractor in Calgary, Alberta— now dead—he wrote No. 20 while lying awake one night in bed. He professed in 1910 in Jim Moore and R. Graham's meetings. He was born in Drammen, Norway 5.6.1869, came to Crossfields, Alberta, 1902, in 1917 took up Chiro, 2 years in Calgary, then Penticon B.C. for 20 years. Died 24.3.1944. Willie Hughes labours in N.Z. "Went forth" in 1906, wrote Nos. 62, 66, 114 and 116. Jack Leach, who lived in Salop, wrote No. 110. Mary Lindley professed in some of W. Webb's meetings in his early days in the States, and is herself a number of years in the work there. She wrote Nos. 306 and 307. Robert Marshall was born in Co. Antrim, after a short time in the work in Ireland went to U.S.A. and to several countries in Europe and is now in Morocco. While in Italy he wrote No. 191. Our old friend and brother John Martin went forth in 1906 from his native Co. Sligo and was for a few years was in the work in Ireland before going to Scotland. He has been writing hymns even before he went into the work, but though we have only two of his in this issue, Nos. 149 and 328, yet No. 149 is considered by many one of the best and most useful hymns in the book, embracing so much that is dear to the heart of all God's children. He has recently died—end of 1956 in his 80th year, born 29.2.1876. In booklet of his hymns there are 149 of his writings. Charlie Morgan, who died a few years ago in U.S.A. came from Wales, he wrote No. 278. Mary McGregor comes from Scotland, she wrote a number of helpful hymns. Nos. 153, 210, 258, 285, 310 and 329. No. 153 was written after hearing J. Carroll speaking of the different offerings. No. 210 written to help a young couple who had newly professed. No. 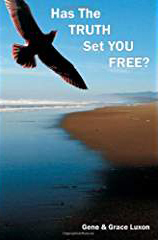 258 when she heard she was to go to U.S.A. originally began, "I've opened my mouth to Jesus." The thought of the years passing prompted No. 310 and 329 at the suggestion of a sister worker who asked for a hymn on "Going On." James Patrick wrote No. 148 in Matilda Smeenk's home in So Dak—1916. Gladys Porteous, a worker in the U.S.A wrote Nos. 82 and 90; the former is a useful hymn in Missions, it was written before going in the work in 1923 on thoughts of J. Carroll, who spoke of Jesus living for us, dying for us, living in us, interceding for us and coming for us. No. 90 some years later when laid aside with illness also on the message of J. Carroll's on the Kingdom of God. Mabel Pryor, also another U.S.A. worker, wrote No. 33. Eustance Radford wrote No. 262 after the death of his beloved wife. At his home Conventions have been held for a number of years in Australia. He has since died—18.4.69. He was acting Baptist Minister (not ordained). When a sister asked him if they could use his Church, he readily agreed and threw in his lot with them and resigned from the Church before the elders could take action against him. Then he became a jobbing carpenter and proved very adaptable. Tom Roberts, an Irishman laboring in U.S.A. wrote No. 287. Mrs. May Schultz (nee Carroll) of Melbourne has written a great many hymns, from her collection we have the following:—Nos. 203, 219, 280, 281 and 290; some of her hymns make very nice solos, but, as already alluded to they were not included. Sandy Scott has also written a number of hymns besides those in the book, we are indebted to him for the following:—Nos. 68, 73, 101, 127, 167, 188, 242, 245, 304, 323, 327, 335. (Re No. 245 this is sometimes mistaken for similar hymn by John Oxenham). Robert Skerritt was in the work in the early days and wrote No. 80. Mrs. [Mabel] Reid Smith was also for a time in the work, she wrote Nos. 286 and 332. A worker in a little meeting after the funeral wondered if that person could speak from eternity what message she would give them, thought it would be—"Fight On, 'Tis Not in Vain," which was the thought that prompted hymn No. 286, and was more conspicuous in the chorus, which was omitted because of the trend towards shorter hymns. No. 332 was written in the hope of helping one that she heard was fighting a losing battle, and no doubt has helped many others since. Milne Stouffer was brought up as an American lumber man and was for a time in the work till he found his nerves shattered, decided to rest for a year or two and went back to the lumbering; it has been thought that when spring came when freeing the frozen logs that he slipped and like so many others at the job found a watery grave; he wrote Nos. 123 and 183. Regarding the latter it is told that he and his companions had been a long time looking for an opening and was told of a very religius man, went to see him but he would have nothing to do with them, on getting back to the road they gook off their boots to ease their feet and found them bleeding, soon after this he wrote the hymn. John Sullivan was born in Dunmanway, Co. Cork 1874, he died in Australia 1924, was for a time a school teacher in Co. Tipperary, where he heard and readily embraced the truth. He soon afterwards went forth into the work- in 1900: he is the author of one of our special favorites, No. 13. The story is told that his sister's husband died died leaving her in distress; John felt he ought to help her, so with the work of his hands he built her a house and put her "on her feet," then he thought, if he could do this for another, he could do it for himself, thus a battle went on in his heart and mind until one day getting under a bush opposite the house to meditate and pray he settled the matter and got the thoughts for the hymn, finally putting them into hymn form on the ship on his way home for a visit to his native shores. Roy Taylor was quite a young worker in U.S.A. when he wrote No. 181, which has since become quite a favourite hymn with many. He has just died in January 1960, aged 55 years he worked in Chile and Argentine and died in Mexico. Thomas M. Turner comes from the North of Ireland; he, too, was a school teacher in Co. Galway, when he heard the truth and also went forth in 1900 for a time in Ireland, and was one of the first to go to Australia. He gives us Nos. 202, 236 and 265. Regarding No. 236, at one Convention someone said that would be a good subject for a hymn—"The Approval of God" — within a short time, the next meeting or so, the hymn was produced and sung. Tom was 81 years old when he died April, 1959. Alex S. Walker, who married Queenie Higgins of Avoca, wrote No. 72, was for a time in the work in New South Wales, is now living in New Zealand; has a daughter in the work in Malay. Mrs. Violet Webster, one of the friends in Melbourne, wrote No. 32. William Weir who comes from Scotland, has been for a number of years in Sweden, he went into the work in 1903. wrote No. 152. Elma [Wiebe] Milton, a worker in the U.S.A. wrote Nos. 81, 160 and 288; No. 81 was written after her mother's death when she was home for a short time and was anxious about her young sister who, while still in her tender teens and had professed, knowing when she left home she would have to face life's battles on her own and so wrote this hymn to be a help. Re No. 288 it was unfortunate we were unable to print the tune from the Alexander book because of copyright difficulties—of which more will be written later. James Wright comes from a village near Debenham, Suffolk, was a number of years in England before he went to Canada, we owe No. 156 and 193 to him. We now come to the hymns by authors unknown to us which are just half as many as those written by our friends, 112 against 223 by the friends. It is to be hoped that by the time the next issue is contemplated there will be many more written by the friends that would fittingly find a place both in our hearts as well as the book. Some writers might take a lesson from those unknown to us who have expressed some wonderful thoughts clothed in beautiful phraseology and metaphor; they seem to have the happy knack of embracing pleasing euphonic sounds in rhyming rhythm that so many of our budding poets lack. Harriet Auber � No. 312 � Our blest Redeemer. H. C. Ayres � No. 78 � One there is who loves thee. Mrs. H. B. Beagle � No. 8 � Wash me, O Lamb of God. Bernard of Clairvoux � Nos. 29 and 204 � Jesus the very thought of thee. Jesus, Thou joy of loving hearts. 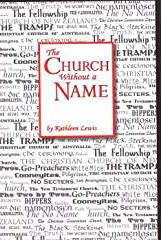 Robert F. Beveridge who jointly wrote with F. M. Davis No 112 � Out of Christ without a Saviour. (Bishop) Edward Henry Bickersteth � No. 317 � Come ye yourselves apart. (Rev.) H. John Ernest Bode � No. 94 � O Jesus, I have promised. Herbert H. Booth � Nos. 54 and 172 � From every stain made clean. Lord Through the Blood. (Rev.) Horatius Bonar � he wrote 600 hymns, the following are his in our book � Nos. 31, 56, 102, 208, 252, 308, and 313. (Rev.) F. Bottome, D.D., � No. 187 � Search me, O God. Jessie H. Brown � No. 305 � One little hour. Arthur S. Booth � Clibborn � No. 282 � There is no gain. Fanny Jane Crosby � Nos. 1, 38, 43, 86, 108, 158 and 299. (Rev.) Philip Doddridge � No. 4 � O God of Bethel. Lizzie Edwards � No. 154 � I must have the Saviour with me. Charlotte Elliott � No. 100 � Just as I am. Charles William Everest, M.A. � No. 24 � Take up thy cross. (Rev.) Frederick William Faber � Nos. 22 and 132 � Souls of men. I worship Thee, sweet will of God. (Rev.) Paulus Gerhardt � Nos. 180 and 209 � God in Heaven hath a treasure. A homeless stranger. Horace E. Govan � No. 70 � O Wanderers come to Jesus. Emily May Cromes [Editor's note: should be Grimes]� No. 145 � Speak Lord, in Thy stillness. Ada R. Habershon � Nos. 180 and 213 � I long to know Thee better. Lie still and let Him mould thee. Freda Hanbury � No. 200 � A life of overcoming. J. S. Haugh � No. 91 � O blessed rest of heart. Francis Ridley Haverhal [Editor's note: should be Havergal]—	Nos. 14, 96, 144, 205, 268, 259, 296 and 311. Annie Sherwood Hawks � No. 88 � I need Thee every hour. Miss Eliza Edmunds Hewitt � No. 11 � More about Jesus. Elisha Albright Hoffman � No. 59 � Where will you spend Eternity. E. H. Hopkins � No. 134 � My Saviour, Thou hast offered. (Bishop) William Walshman How � No. 95 � O Jesus, thou art standing. Bernard Severine Ingemann � No. 272 � Through the night of doubt and sorrow. Annie L. James � No. 26 � Is there a heart that is waiting. Mary Artemesia Lathbury � No. 253 � Break thou the bread of life. John Lawley � No. 162 � Hearts it is the world requires. W. Leslie � No. 309 � Under the burdens. C. G. Lyne � No. 109 � Still undecided. (Rev.) Francis Henry Lyte, M.A. � Nos. 42 and 122 � Jesus, I my cross have taken. Abide with me, fast falls. (Rev.) George Matheson, D.D. � No. 5 � O Love that will not let me go. Albert Midlane � No. 119 � Passing onward, quickly passing. W. W. Morse � No. 9 � There's a hand held out in pity. Edward D. Mund � No. 240 � Amid the trials which I meet. Mr. Macnaughton � No. 276 � Live for others. Nathaniel Norton � Nos. 23 and 115 � Come unto Me. Oh what will you do with Jesus. (Rev.) Johnson Oatman � No. 289 � When storms of life are round me beating. Anna Olander � No. 293 � If all things were mine. A. A. Pollard � Nos. 48, 223 and 247 � Have thine own way Lord �I cannot see beyond the moment � Shepherd of Israel. Mrs. Jessie Brown Pounds � No. 103 � I must needs go home by the way. Mrs. Elisabeth Payson Prentiss � No. 294 � More love to Thee, O Christ. George Scot Railton � No. 111 � Jesus my Saviour, King. (Rev.) Wade Robinson No. 275 � Loved with everlasting love. (Rev.) A. B. Simpson � Nos. 2, 7 and 64 � Jesus only is our message � Oh how sweet the glorious message � I will say "Yes" to Jesus. W. T. Sleeper � No. 69 � A Ruler once came to Jesus. Clara Teares � No. 40 � All my life long I had panted. Gerhard Tersteegen � Nos. 206, 211, 260 and 261. Kate Ulmer � No. 118 � Where shall I flee for refuge. W. Spencer Walton � No. 12 � In tenderness He sought me. Mrs. L. Ware � No. 178 � Precious thought, my Father. Anna Letitia Waring No. 175 � My heart is resting. Anna Bartlett Warner � No. 297 � We would see Jesus. (Rev.) George D. Watson � No. 120 � I hear my dying Saviour say. (Rev.) Isaac Watts � Nos. 15, 163 and 194 � When I survey — O bless the Lord, my soul � In all my vast concerns. Major Daniel Webster Whittle � No. 44 � Have you any room for Jesus. W. Whittingham	No. 246 � The Lord's my Shepherd. Mrs. E. E. Williams � No. 113 � I have made my choice for ever. P. B. � No. 231. E. C. � Nos. 10, 143, 318, 320 and 322 [Editors Note: These were written by Edward Cooney]. Mrs. H. B. G. � No. 298. G. Bowdler — No. 155. S. Jones — Nos. 126, 225, 250 and 266. H. Roberts — No. 198. G. Smith — Nos. 104, 212, 214, 218, 227/8, 229, 230 and 251. Frank Davis — No. 112. A. J. Hodge — No. 92. Wm. J. Kirkpatrick — No. 121. J. B. Mackay — No. 25. Mrs. C. H. Morris — Nos. 83 and 169. J. M. White — No. 25. Arthur Heselwood —No. 166 was born in York in 1872, heard the truth in Lincolnshire, 1905, where he was a schoolmaster and soon after"went forth" 1911 with Mrs. Heselwood and continued until a year or two before his death in 1953. Our old friend, Joe Macadam, wrote No. 310. He heard the truth in open air meetings in Durban, but did not professs till he and Mrs. Macadam returned to England in 1908. His last days were spent in Convey Isles, where he died in 1947. His wife lived on till 1954 and was one of those who had an exciting rescue from Convey in that tidal flood of early 1953. Lucy Manning, who has been in the work in Tasmania and Australia a number of years wrote tunes Nos. 186 and 217. Her father James Manning, went to New Zealand from Co. Wickow about the year 1917 with his brother Ned, who had been for a time in the work in Ireland and continued in New Zealand. I may be allowed to say a little of my own efforts [Editors Note: Writer is Bert Pattison.]. My first attempt for John Martin's Hymn No. 149, which he wrote to the tune of "Rowan Tree, " and which I did not care for in the setting. (time, etc.) when I first saw it. At one convention, John told us we should have the cheek of a spider, for he gets into the King's palace, so I had the cheek to send my effort to John. He replied, "Your tune doesn't come within a Sabbath day's journey of the 'Rowan Tree.' " However, I kept on like Bruce's spider, in spite of failure and had the cheek again to write a few that found their way into the book,the following are the numbers: 160, 164, 193 and 279. We might now mention this hymn of John Martin's, No. 149, which was set to a tune composed by D. E. Roberts, a Welshman, who was in the work for sometime. The tune "Rowan Tree" was included as quite a few prefer to sing it to this tune, especially since it has the "time" altered. Our esteemed brother and helper in this matter, Andrew Robb, is the writer of No. 163. Ethel Roehl, a worker in Pennsylvania, U.S.A, wrote No. 120. Glen Smith, besides writing music for most of his own hymns, wrote the tune for J. Fawcett No. 215. Printed by Wm. Trimble Ltd., 8 & l0 East Bridge Street, Enniskillen. The above states that: Robert Skerritt was in the work "in the early days." (Editor's Note: According to the 1905 Workers List, Skerritt started in the work in 1902; therefore the "early days" must have been sometime around 1902. He left the 2x2s and became a follower of Wm. Irvine's Omega Message. Edward Cooney, a highly visible and prominent worker in the Early Days, wrote some well known hymns: Nos. 143, 318, 320, 322 in the 1987 Ed and No. 10 in the 1951 Ed.. He was excommunicated in 1928 and his hymns are listed above as "Anonymous Hymns or with Initials Only."